Cloud support. See the official release notes on the TP-Link website. Auto-backup, but the Windows-way. See below for the Linux-way to do backups. From what I saw so far, the directory structure has been cleaned up. Photoshop file with icons from v2.7.0 has been removed from the images directory. GUI now seems much more cleaner, too. Well done, TP-Link! EAP Controller starts ~30% faster compared with v2.7.0. All steps in the initial wizard now can be skipped! Finally my feature request was honored, thanks to R&D very much! What's new in the Linux release? Logo now shows »Community version« below the TP-Link logo, so you can recognize it better. dump lets you dump the database as well as the maps and keystores. restore lets you restore a database dump including maps and previous keystores. Update #1: New tpeap 1.4 has been released (see this post for more details). For your convenience, I have attached the new tpeap script v1.4 to this posting, too. It might be handy for doing a backup of your v2.7.0 installation, which can be easily restored in EAP Controller 3.0.2. Update #2: The tpeap 1.4 just has been added to the TAR archive with Omada Controller 3.0.2. If you download the TAR archive as described below, you will get the new tpeap script already - no need to install it twice. Standard disclaimer, as usual: Use at your own risk. This community version (cv for short) is neither released nor supported by TP-Link and it still needs some testing. — If you want to install the Linux version for the first time, please see this post first, replace the instructions in step 2 there with the instructions in the same step 2 in this post below and proceed with the remaining steps here when you have installed all the pre-requisites (eapc role account, Java JRE, mongodb database). — If you already have installed Omada EAP Controller 2.7.0cv on your Linux system, just read on. tpeap will create the directory, copy your maps and keystore to it, and then execute mongodump, which dumps the database in binary BSON format into the backup archive. Now you can safely stop the EAP Controller. As usual, the TAR archive is in the private section of my FTP server. You won't see any files there, but you can download the archive. Installation is straight-forward: Extract the TAR archive as root in /opt/tplink, remove the symlink EAPController pointing to version 2.7.0cv and create a new one pointing to the EAPController-3.0.2 directory just extracted from the TAR archive. Easy, isn't it? If your mongodb version is >= 3.6 you need to edit the argument list EAPC uses to start the mongod daemon. The option --nohttpinterface, which is set by EAPC, has been removed in mongodb version 3.6 and newer. Of course, you can use any other editor, too. The color-intense theme awesome with FontAwesome icons - no more image files needed, clean layout for EAPC 2.7.0cv. 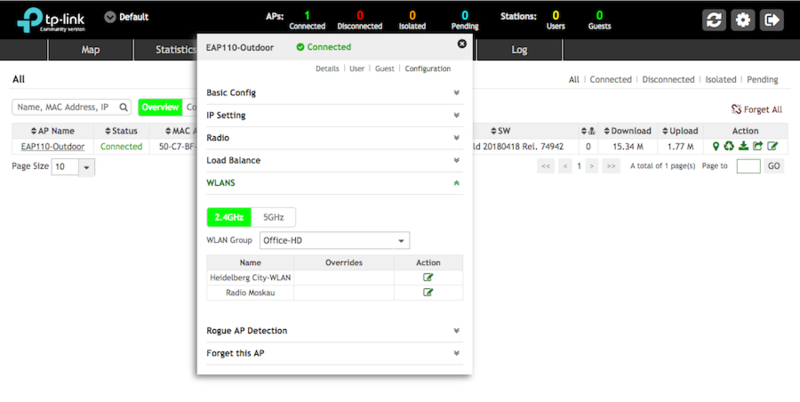 Re: Omada EAP Controller 3.0.2 for Linux is here! But again error. I think I need to redo the mongod nohttinterface again? Will your guide work as well for the Rasberry pi? Hmm, should not be necessary for the mongod version on Raspbian (or I have probably an older version?). Did you check wether you can connect to the EAPC using a browser? It's somewhat slow in response. Check version of mongod. If < 3.6, then no action is required, else you would need to remove the option from the properties, either using the recipe or using your preferred editor (pico, nano, vi, whatever). Re:Re:Omada EAP Controller 3.0.2 for Linux is here! @Jonas_TP-Link Is it planned by HQ to develope Linux version of Omada Controller? It has no sense that R1D2 can make it and RD no. If I test I will post the results. Yes, of course. We are making the Omada Controller 3.0.2 Linux, it will be publish recently. The messages in the startup.log are just status messages on successful start of the DB, I see no errors there. This monring the webservice was working. It's just really slow in boot, and the error it gave during start up can be ignored I guess. That's all, works fine on my RasPi. If you get it running, please reply, I will mix us a »White Russian« drink then. I'll mix us that drink now it's all is up and running and actually running pretty smooth on the Pi now! Thanks again for the really quick reply and guidance ! Glad it finally works for you! Probably error messages just appear because tpeap by default waits for only 70 seconds until Omada Controller is ready to serve requests. That's a much too small time-out for the RasPi. To get rid of those message, you can either start Omada Controller asynchronously (omit option -w to tpeap) or increase the wait time-out by changing WAIT_TIME in line 52 of the script, there already is a (commented out) line for the RasPi platform, which increases WAIT_TIME to 240 seconds. Next version 1.4 of tpeap will make it very easy to permanently set this time-out without needing to edit the script. Stay tuned, I'm just finishing the manpage before it will be released. Works great ... did a clean install on a Pi. I only get a 'General error' when try to bind it to TP-Link cloud. Any ideas? I did hear this from another user already, but have no idea what could go wrong. I tried to bind with the cloud server on my Debian and Raspbian systems and it did work, no matter wether I do so in the wizard (with or without a changed Controller name) or later in the Cloud menu and no matter wether I do it with a fresh install or after restoring the database with a dump from earlier versions. What did you do exactly to bind your TP-Link ID? Can you log into the cloud server directly using your TP-Link ID? I already had a working TP-Link ID, I bound a Windows controller earlier. This morning I tried a fresh raspbian install and it works like charm now. I also get "General Error"